Editor's note, April 25, 2016: Mohu has instituted a voluntary recall of the BeBox after one unit caught fire during an unmonitored test. If you own a BeBox, unplug it and stop using it immediately. Mohu customers will find instructions for obtaining a full refund here. Boomboxes were everywhere in the 1980s. Throw in eight D-cells and you had a portable, all-in-one stereo system with a single—or even a double—cassette deck and an AM/FM radio that could go anywhere around the house, in your back yard, or to the beach. Indeed. 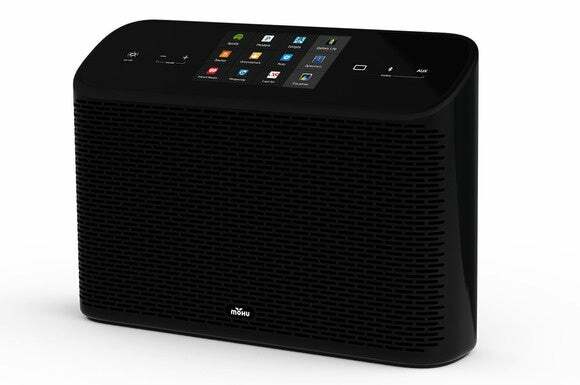 On the surface, Mohu’s BeBox looks like it’s nothing more than a Bluetooth speaker—a big one. Standing 13.5 inches tall and 19 inches wide, the BeBox is physically imposing. But then you notice the 7-inch color touchscreen embedded in the top of cabinet. And what’s this? An HDMI port? Okay, maybe the BeBox is something different. 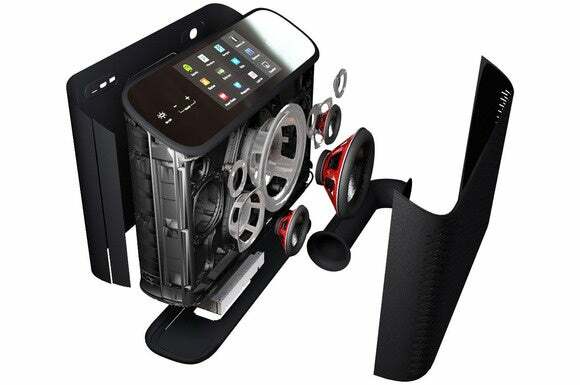 Having an embedded Android tablet enables this speaker to do a lot more than play music. A tablet? In a speaker? That 7-inch, touchscreen is more than just a 1024x600-pixel display—it’s a full-fledged Android tablet powered by an ARM Cortex A7 quad-core processor running Android 4.4.2. The first time I powered the system up, it stepped me through the process of joining my wireless network (it has an onboard 802.11b/g/n Wi-Fi adapter) and prompted me for my Google ID. I was ready to rock within just a few moments. The BeBox supports streaming from Bluetooth devices such as a smartphone or tablet, of course, but it offers alternatives if you don’t want to tie up your mobile device. You can plug in a USB thumb drive (up to 64GB of flash memory), a MicroSD card (up to 32GB), or any analog audio source via its 1/8-inch input. The USB port will also charge the battery in a connected Android or iOS device; unfortunately, you can’t access the storage on a connected smart device. 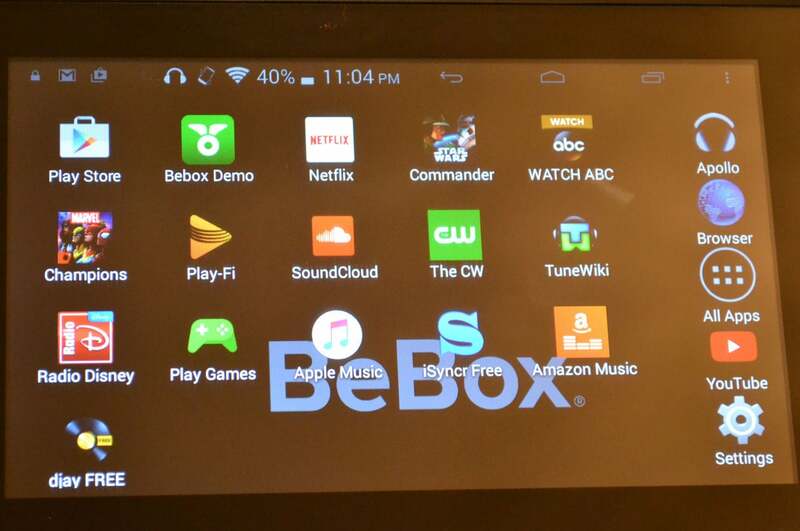 Having an Android tablet at its core enables the BeBox to run almost any app or service you can think of: Do you listen to music through Pandora? Are you a Spotify or Tidal subscriber? Do you get your music from Amazon Prime? Are you an Apple Music subscriber? Do you like playing music via YouTube? No problem. Navigate to the Google Play Store and download whatever you need. 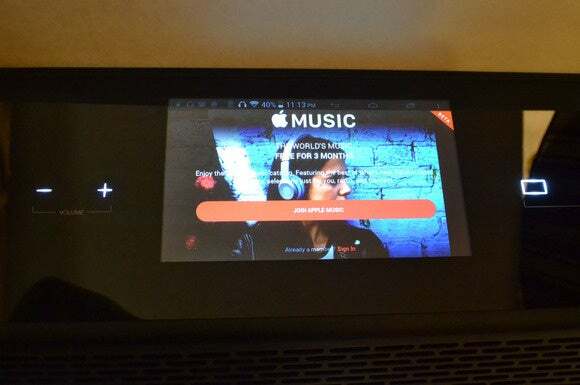 The BeBox can play music from almost any source, including Apple Music. And you’re not limited to music apps, either. Once I’d downloaded the Watch ABC, PBS Kids, and the CW apps and connected the BeBox to my big-screen TV’s HDMI input, my family and I could watch full episodes of our favorite TV shows in high definition, using the BeBox as a high-quality sound bar. Do you own a portable video projector? Take it outside, hook it up to the BeBox, stretch a sheet between two trees, and host a backyard movie night for the neighborhood. The 16000mAh battery will power the speaker for about eight hours. The primary reason the BeBox’s cabinet is so large is to accommodate the number and the size of its speakers: The BeBox has five: two soft-dome tweeters on either side of the unit; two 3.0-inch midrange drivers; and a 6.5-inch high-performance, long throw woofer augmented by a front-facing, vented bass port. With a discrete amplifier powering each speaker, the BeBox can move some serious air. This exploded image of the Mohu BeBox provides a view of its five drivers and bass port. The BeBox delivered great performances with music, delivering nicely detailed sound. The folks at BeBox intentionally boosted the system’s bass response, which would normally make me cringe because it would muddy up the sound. But it’s handled well in this case, especially when you use it in outdoor environments where there will be no room gain (the bass reinforcement you get from sound waves reflecting off interior walls). I will note one sonic negative: My review unit had an elevated noise floor regardless of input, an issue that was more prevalent with content played via Android apps than music streamed via Bluetooth or it AUX input. But this was noticeable only when I played the BeBox at very low volume levels, which won’t be typical with this type of speaker. I certainly don’t consider it a deal-breaker. Bluetooth support is something of a check-box item for the BeBox. Yes, you can easily stream music from your phone to this speaker, but you probably won’t much. At a party, the BeBox performed more like an old-fashioned jukebox as people gathered around it to queue up their favorite tunes. I didn’t need to relinquish control of my phone, I didn't worry that an incoming call would end up playing for the entire room, and I could walk away without the music sputtering to a halt. Mohu describes the BeBox as a wireless boombox, but it’s far more than that. The presence of an entire Android tablet inside a portable speaker with an HDMI output is a revolutionary concept. The only feature I can imagine adding would be an embedded pico projector to deliver a truly mobile home theater, but that would undoubtedly increase the BeBox’s $499 price tag. As it stands, this is a great entertainment system. The BeBox merges a great-sounding Bluetooth speaker with a dedicated set-top box. The presence of an onboard Android tablet, expandable storage, an HDMI port, and an 8-hour battery means this system can go from the living room to the backyard, to a beach party.